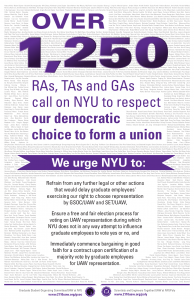 More than 1,250 RAs, TAs, and GAs from NYU and NYU-Poly have now signed onto our open letter urging NYU to respect our democratic choice on unionization. Read the full letter below. When the law required NYU to respect the right to collective bargaining, a majority of graduate employees chose Graduate Student Organizing Committee (GSOC/UAW) and bargained improvements to pay, benefits and rights in a 2002 contract that graduate employees and NYU both hailed as a landmark agreement. In 2005, however, the NYU administration took advantage of weakened laws to deny this right and refused to bargain a second contract. 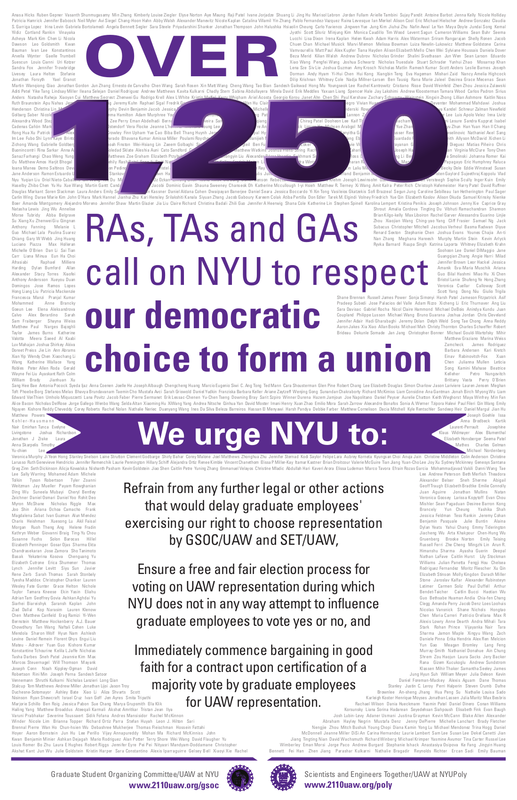 NYU will immediately commence bargaining in good faith for a contract upon certification of a majority vote by graduate employees for GSOC/UAW representation.